Much of the world’s essential infrastructure is built along congested coastal belts that are composed of weak, highly compressible and low permeable soils to significant depths. Soft alluvial and marine clay has very low bearing capacity and excessive settlement, properties which pose design and maintenance implications for tall structures, large commercial buildings, as well as port and transport infrastructure; these properties often hamper the development of transportation infrastructure including embankments. These very soft deposits must, therefore, be stabilised before constructing any infrastructure in order to prevent unacceptable differential settlement. Several ground improvement techniques to improve soft ground have been applied by different researches, of which Prefabricated Vertical Drains (PVDs) combined with surcharge and vacuum preloading is an efficient, cost-effective and popular technique to accelerate consolidation. This paper presents an overview of the theoretical, experimental and numerical developments of soft ground improvement via PVDs including natural fibre drains combined with surcharge and vacuum preloading, with applications to selected case studies. The author would like to thank more than a dozen PhD students and research fellows who contributed to the field of soft ground improvement directly and indirectly during their time at UOW. The assistance from laboratory technicians Alan Grant, Cameron Neilson and Ritchie McLean during the laboratory and field work is also appreciated. The authors acknowledge the Australian Research Council (ARC) and Industry partners for providing support through the ARC Industrial Transformation Training Centre for Advanced Technologies in Rail Track Infrastructure (ITTC-Rail). The author would also like to acknowledge Australian Research Council (ARC) for providing funding to the research via several linkage projects in the field of soft ground improvement over the last two decades. Most of the contents produced in this paper are reproduced with kind permission from the Australian Geomechanics Journal (e.g. 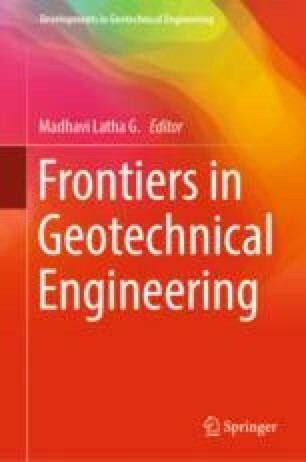 Author’s 2009 EH Davis Lecture), Journal of Geotechnical & Geoenvironmental Engineering ASCE, International Journal of Geomechanics, ASCE, Proceedings of the Institution of Civil Engineers – Ground Improvement, ASTM Geotechnical Testing Journal, Géotechnique and Canadian Geotechnical Journal among others.